At the time that seemed like a valid sentiment. After all, since winning the world title in 2001, Britain’s 4x200m freestyle relay team has been seen as one of the national team’s greatest strengths, so to have that cohort of sub 2-minute swimmers could only demonstrate an ongoing strength in depth and the opportunity to challenge for the podium places come the world championships later this year. How quickly things changed. Britain had been the first major swimming nation to complete its world championship trials and while the performances in the 200 free set a target, it was always there to be shot at by others. In particular the Australian squad showed a formidable strength. Where Britain had 6 women under 2:00.00, Australia had 6 under 1.58.00, headed by two 1.55 efforts. If that wasn’t enough China also reminded everyone of their pedigree in the event as they seek to defend their world title in home waters. They couldn’t match the Aussies, but still boasted three ladies home in the low 1.58 area. Add an ever strong USA team, who won’t have trials this year having preselected their squad, to the mix along with strong squads from France and Hungary, both of whom headed Britain at last year’s European Championships and the scale of the challenge to win a medal becomes apparent. But has the British relay been as much of a strength as is often thought? 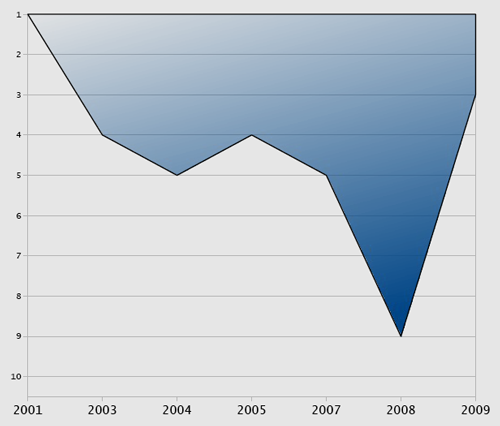 The graph below shows the performance at global championships over the past decade. 2004: Marshall is world number 1, but the team can’t match their rankings, coming home 5th as the USA takes another gold. 2008: An apparent miscalculation with the team selection in the heats sees the team fail to qualify for the final. 2009: In the suit powered final, the team secures bronze behind China and the USA, beating Australia. The team has undoubtedly been consistently competitive; 2 medals having been achieved in 7 competitions, represents a positive return. What’s clear however, is that the squad has always really been challenging for the minor podium spots and that seems unlikely to change in Shanghai. But can the team retain the bronze they won in 2009? While it would be reasonable to expect Adlington for one to be faster with a full taper behind her, the team as a whole would need to step up. Jazz Carlin has shown herself to be a big time performer, and likely to be the second part of the quartet. Who makes up the foursome will be an interesting conundrum. Will it be 10km specialist Kerrie-Anne Payne, who was third home at trials, medley specialist Hannah Miley, Jo Jackson, who is still yet to get back to her best form, or newcomer Rebecca Turner. There’s also the possibility of other swimmers adding themselves to the melting pot at the ASA championships in June. Either way there could be some intriguing relay challenges in the pre world championships camp. History suggests we shouldn’t expect a medal in Shanghai but the competition that this will engender could just make the difference between fourth and third.